When PT bobbin used as filter bobbin relates to a line filter, which restricts magnetic influences of a leakage flux from a closed magnetic circuit core on other components and restricts entry of noise to the closed magnetic circuit core. The line filter comprises a synthetic resin bobbin PT having flanges at both ends thereof and a through-hole formed in an axial direction, a round-shaped closed magnetic circuit core inserted into the through-hole formed at the center axis of the bobbin PT, a winding so wound between both flanges of the PT bobbin as to orthogonally cross the axial direction, metal terminals planted to the flanges and connected to the winding, and rotation prevention means for preventing the rotation of the closed magnetic circuit core. 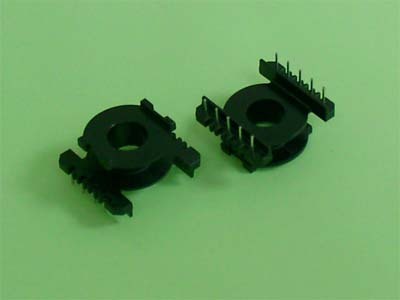 Bobbin PT Series are for Ferrite Core used in Filter, Switching Power Transformers, Switch Transformer, Inductor, Coil, etc.